One of the great specialities in watch collecting is the field which I call functional watches. Watches that were designed for a specific purpose or profession, like military watches, navigation watches, divers watches and even doctor's watches. Not designed for beauty or as jewelry, but only to help people perform their task to their best where it involves time keeping. Functional watches. Of the many different professional watches, military timepieces hold a particular interest for me, and aviation watches in specific. The robustness, accuracy and high contrast dials make them even beautyful, and have gained in appreciation of the collecting world. Not only watch enthausiasts, but also collectors of militaria and scientific instruments show a fascination for military timepieces. Quite recently, I aquired a new "Objet d'art", to be added to my humble collection of "functional watches": a J. Auricoste type 20 aviators chronograph. A what? OK, I know, many people are not familiar with the brand name. 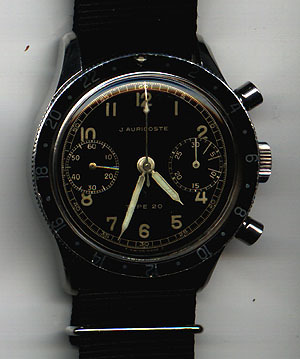 J. Auricoste was one of the few contractors that built watches for the French Airforce, mostly chronographs. Other brands that were contracted were Dodain and Airain. But the one I have is not the standard type 20 Auricoste. It does not have the usual base metal/stainless steel case, and it has no markings on the back. The military issue type 20's have a marking on the back, indicating it was tested and approved by the factory to meet the military standards. The letters FG and a date show when it was tested. The watches were checked every time they went back to the factory for maintenance. Mine, however, has a full stainless steel case with a steel 24 hour rotating bezel, and the case shows no markings at all. The movement on the type 20 watches is a high grade Lemania 15 TL 2040 with Flyback function. When the chronograph is running, the reset button at 4 o'clock resets the chronograph but leaves it running: instant zero setting. Similar functionality is found on some Longines chrono's as well, and is sometimes mistakenly named Split Second function. The later type 21 came with a Valjoux 222, but is hardly as beautiful mechanically as the Lemania-fitted type 20. Possibly this watch was made for Civilian use, rather than military. It is not uncommon that military timepieces were sold in a different configuration for normal use, maybe civil aviation. The movement is signed properlly with the name Auricoste and Type 20. Maybe it is a refit, but it nevertheless is a beautiful timepiece with remarkable accuracy. I received the following email from a reader, which I thought was interesting to share.